For managed service providers (MSPs) looking to put break/fix services in the rear-view mirror, new applications and cloud-based storage options have unlocked opportunities for agility and growth — growth in customers, revenue and portfolio of services. Now, the global market for managed services is booming, with an estimated value of $257.84B by 2022. However, new challenges have surfaced alongside these new opportunities. With such vast numbers of services, vendors and technologies available, the typical MSP uses 11 different tools to deliver managed services to their clients . Across all customers, MSPs often have several applications and storage options in their portfolio that serve the same purpose, resulting in customized technology stacks to service specific customer demands. 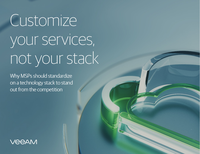 Customized stacks may seem like a great way to deliver a unique customer experience, but it eventually comes at the cost of growing your business and delivering the high standards of customer service expected. MSPs who standardize their stack can actually deliver BETTER services, providing a consistent experience for every customer.